Marriage Line: It is found parallel under the little finger. Marital life becomes good and happy if it is clean and clear. If this line goes downward then it is not good. It increases problem in marital life. If this line is broken or in two parts then there might be separation in marriage. Love Line: It is found under the Moon Mountain or Venus Mountain. They are small. Love relations start when these mountains become pink. If Venus Mountain emerges then one does love marriage. However, if there is net on these mountains then one cannot get success in love marriage. Progeny Line: It is found above the marriage line and root of Venus Mountain. It also denotes the children’s condition. If there is cross, mole and branches then one face problem in progeny. However, if Jupiter is strong then this line gets support from it. Employment Line: It is found on Shani Mountain and lines which are going upward. It is decided by strong mountain or strong line on the palm. If emerges of mountain reduces or tone of palm reduces then one face problems in employment. 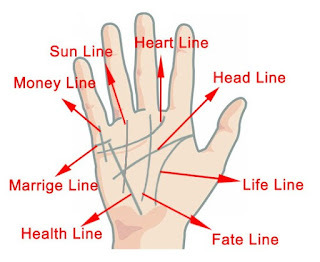 Health Line: It goes from life line to Mercury Mountain. One gets information from life line. If there is square on this line then it is very good. Other signs are not good. Wealth Line: There is no special line of wealth. However, there are special signs such as straight line on Jupiter Mountain, dual line on Sun Mountain or triangle on palm. One has good wealth if his palm color is clean and pink. However, if the palm’s color is press or blackness then person faces many problems regarding wealth. 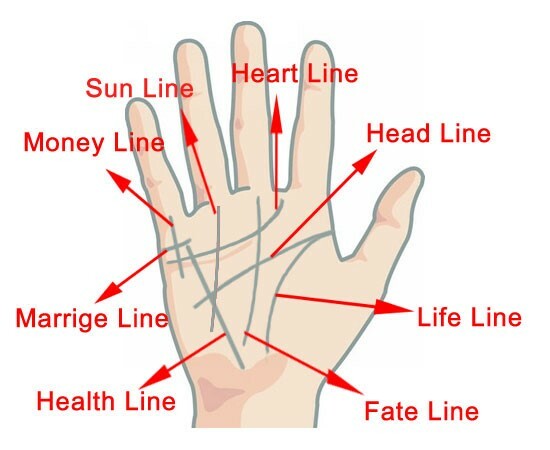 Age Line: Many people believe that life line is age line. But one can know about age from other symptoms on palm. You can study mind line and Shani Mountain and know about the age. Square always give good result for age line. However, cross creates problem in age. Fame Line: It is found on Sun Mountain. If this line is double then person easily get fame. If there is star and triangle on Sun Mountain then person gets great fame. If there is annulus mole or stain then person gets more disgrace. Home Line: It starts from Mars Mountain and meets to life line. One gets property at the similar age when it meets on the palm. One faces problem in property if this line is weak. Vehicle Line: It is found on Shani Mountain or Jupiter Mountain. It is straight and clear. Strong Venus Mountain also gives happiness from vehicle. If there is annulus or star on Shani Mountain there is high chances of vehicle accident. Remedy: One should bow if he/she has true faith for someone. Do not bow for show off or torpid.